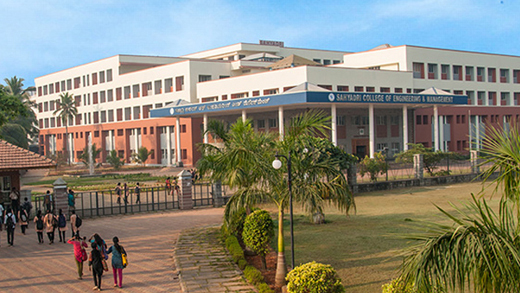 Mangaluru, Feb 27, 2017: As per an official communique received from the Sahyadri College of Engineering & Management, NAAC, National Assessment and Accreditation Council, held an accreditation evaluation of the institution recently and it was accredited with “A” grade with a score of 3.09. NAAC is an organisation that assesses and accredits institutions of higher education in India. It is an autonomous body funded by University Grants Commission of Government of India headquartered in Bangalore. It holistically assess institutions under categories : 1.Curricular Aspects, 2. Teaching- Learning & Evaluation, 3. Research, Consultancy & Extension, 4. Infrastructure & Learning Resources, 5. Governance, Leadership & Management, 6. Innovation & Best Practices, 7. Student Support & Progression. Assessment is done through interaction with all the stakeholders of the institution, covering Students, Alumni, Industries, Parents, teaching and Non teaching fraternity. The committee was extremely happy with the processes at Sahyadri and appreciated the additional efforts made to prepare Practicing Engineers through varied programs and activities beyond the curriculum. They highlighted much valued Hands on Experience Laboratory, Innovation Centre, Entrepreneurship cell and Varied clubs that aid the students professional development. They also held placement process pooling best of the companies to aid placement and internship. The management’s proactive efforts which are student centric to groom Engineers contributing to society and value driven. Sahyadri Institution has been come up recently but has been successful i training the students well with all modernised education facilities .